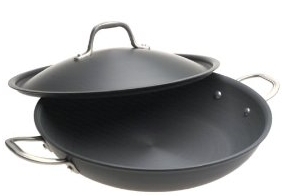 Amazon has some of the Calphalon cookware at incredible prices again. Some of them are as much as 80% off like the Calphalon Commercial Hard-Anodized 12-Inch Everyday Pan with Lid for only $32.99 (org $168) or the Calphalon Commercial Nonstick 10-Inch International Griddle/Crepe Pan for only $24.99 (org $85) or the Calphalon Commercial Hard-Anodized 2-1/2-Quart Shallow Saucepan with Lid only $29.99 (org $119). All of these ship free with Amazon Prime. These are great prices for some high quality cookware.